The philosophies underlying Basis designs are the sound principles of physics; provable concepts that result in the most accurate replay of records possible. Precise execution of those principles is critical, and youll find Basis turntables are made with exacting care and precision machining unsurpassed in the industry. Central to A.J. Contis design philosophy is the Basis System Approach of product development. Here, each individual subsystem contributing to the performance of the product is identified. Specific goals for the performance of each subsystem are developed based on the function of that system. Each design is based on the fundamental principles of physics, and then tested and optimized to perform its function to the highest level. Only after each system has demonstrated superior performance at its defined function is it approved for use in the final product. The result is a purposefully engineered product. When looking at other products it can be obvious that the designer has fallen in love with a certain aspect of a product. This may be a novel shape, a supposed isolator made of many layers of materials, or an unusual material. Such shortsighted, incomplete designs are all too common in the record player field and result in one-dimensional performance. With the Basis Systems Approach, the buyer is assured of a complete design, a truly refined final product that will withstand the test of time by performing at a state of the art level for decades. There is solid engineering and precision fabrication behind every Basis product. 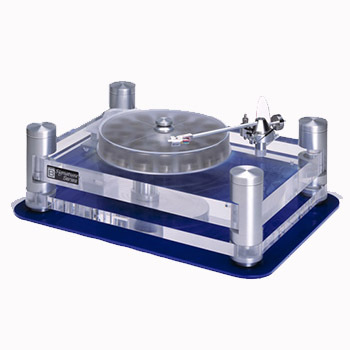 To appreciate the level of sophistication, lets examine the thinking behind each main component of the turntable system. The 2200 is a brilliant mix of performance and value. Borrowing heavily from the 2500, the 2200 achieves a remarkable level of resolution at its price point. The 2200 platter is machined from a solid block of stress-relieved acrylic. Its thickness, like the thickness of the 2200 subchassis, is closer to the thickness of the 2500 platter than to that of the 2000. The surfaces that mate to the bearing are derived from the Debut platter/bearing mating system. A large horizontal diameter forms the vertical mating surface. The result is undetectable vertical motion of the 2200 Signature platter as it rotates, meaning less woofer pumping and less amplifier strain. The vertical motion of the rotating 2200 platter is equivalent to the thickness of a human hair or less. The radial location is provided by a pair of concentric cylindrical surfaces, which provide superior accuracy to the ubiquitous tapered shaft so often seen in lesser products. The superior radial precision of this fit forces the outer belt-driven surface of the platter to be perfectly centered, again guaranteeing the great speed stability of the 2200 Signature. 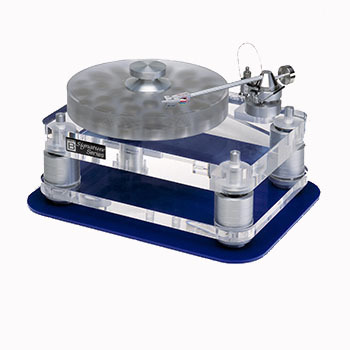 At the top of the Basis 2000 Series sits the model 2500 Signature and 2800 Signature turntable with vacuum clamping. Their 2 thick acrylic platters sit on an ultra-close tolerance bearing which is mounted to a massive 2, stress-relieved acrylic plinth. The combination produces breathtaking results. The Debut turntable is the result of the same Basis Systems Approach of product development as other Basis products, where each individual subsystem contributing to the performance of the product is identified. Specific goals for the performance of each subsystem are developed based on the function of that system. Each system is designed, based on fundamental principles of physics, and then tested and optimized to perform its function to the highest level. Only after each system has demonstrated superior performance at its defined function is it approved for use in the final product. The subchassis forms the base that holds all of the systems (drive, suspension, bearing/platter, tonearm mount) together. 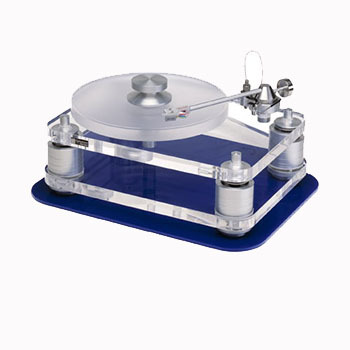 Ideally the subchassis should provide a rigid, non-resonant support for the turntable system components. The massive, two-inch thick stress-relieved acrylic Debut subchassis indeed provides such an ideal support. The acrylic material is cast as a solid block and stress-relieved for stability. The material itself exhibits superb low-resonance characteristics without the need for problematic damping with elastomer materials. One needs only to cue the stylus directly onto the subchassis on Debut, turn the volume up, and tap the subchassis with various light objects such as toothpicks, small hex keys, small screwdrivers, and the like. You will note that the sound from the speakers is different for each object and sounds like the material of that object striking acrylic. Further, the sound is immediate and short without echoes, overhang, or ringing. Such a simple test, performed with other subchassis materials, will show the benefits of solid, thick, cast acrylic as used for a properly designed turntable subchassis. The Debut subchassis provides the inert structure that a true, neutral, state of the art record player requires.